Experimental Film Review: Alex MacKenzie "The Wooden Lightbox"
Alex MacKenzie "The Wooden Lightbox"
﻿ My first experience with Alex MacKenzie and his films was an amazing show presented with two variable speed projectors two years ago here in Regina, Saskatchewan. 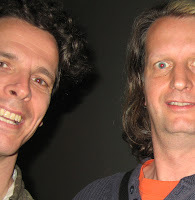 It was therefore with great anticipation that I entered the screening at the Antimatter Film Festival in Victoria last week where I would have a chance to experience Alex MacKenzie’s new film project, and “experience” is the essential word here. Seeing Alex present his films is central to the work. This is not to say that the films don’t stand on their own; if I had one of his reels and I threaded it up myself and watched it, it would certainly be worthwhile. Alex uses a variety of printing techniques, he creates his own emulsion, and he selects images that are ironic and iconic to create lush and engaging film images.. However, a non-facilitated screening would not be the same experience. We often forget that the projector is not a static object, it is the last piece of the apparatus to affect the motion picture film before the audience sees it. Alex MacKenzie does not forget. In my opinion, his greatest achievement has been in the art of film projection. 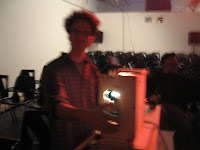 Alex MacKenzie’s September 27th screening of The Wooden Lightbox at the Antimatter Underground Film Festival featured a solo projector modified to run with a crank rather than an electric motor. As Alex was turning the crank to directly move the film forward, he could respond immediately to the reaction of the audience, the relationship to the prerecorded soundtrack, or to his own improvisational ideas. Like stage, the art is in the performance and the relationship of performer to audience. The script, represented by the images on the film and the soundtrack playing, remains static with countless variations possible in terms of pacing. The projecting of the film is also very physical, the crank needs to be turned almost continuously, a one person show that requires real sweat, reminding us again of the performative aspect of this creation. Another important part of the physical/organic nature of the show is in the sound that the machine makes and the presence of Alex within the audience turning it, changing film reels, and making noise. This was prominent in the aforementioned two variable speed projector show. However, as the hand cranking creates only the sound of the moving gears and shutter rather than the much louder nature of a motorized projector, and with the music/soundtrack turned up loud as it was, the sound of the device/apparatus was imperceptible and reduced our awareness of the process. Compounding that, I was a amongst the ½ of the audience who sat in front to the projector and thus was not constantly reminded of Alex’s activities with his projector. As such, I was forced to choose between watching the screen (mysterious, engaging images in front of me) or watching Alex (drowned out by the soundtrack and standing behind me). Clearly most of my attention landed on the screen. Were someone to be attending another of his events of this nature, I recommend seating yourself where you can keep an eye on both screen and projector. The images themselves flicker, being cast onto the screen at less than the industry standard 24 fps but rather at a range between 4 and 8 fps. Slower flickering has become part of the codification for silent cinema and, as part of our mythology, for innocence. To me, the most memorable image was of a bird and of a cage. As separate images, Alex is able to show us them slowly on the screen, like a magician demonstrating an empty sleeve or hat. As the images speed up, flickering back and forth between the cage and the bird, we begin to perceive that the image of the bird is inside the cage, even though in reality it is not. I use these same images in my teaching; using a 19th century educational toy zoetrope, I draw a bird and cage on opposites sides of a round card than can be spun with cords tied to either side of it. As a toy, it reinforces the time of innocence suggested by the flickering. For me, this familiar bird/cage (amongst a vast collection of other images referencing the advent of cinema) was comforting and amusing. Another mesmerizing moment came between reels when Alex held a lens in front of the projector lens, moving it slowly in from the side. As he shifted it towards and away from the projector, the ring came into focus and in the middle of it was a strange little face. I wondered if it referred to the moon face in Melies’ “A Trip to the Moon”, but it did not seem right. Afterwards I asked Alex about it and found that there was no face affixed to the second lens at all, but the shape was merely the filament of the projection bulb brought into focus. The imagination is a wonderful playground. The Wooden Lightbox is about remembering, about throwing ourselves back to a time when audience expectation was open, with the projection of films equally non-rigid. The degraded quality of the images, often created through the alternative emulsions and hand processing of the film, helps to reinforce the notion of lost memories and decaying history. By reviving some of the technical approaches (although using modified contemporary projectors and not actual vintage units), Alex preserves some of the spirit of that past and shares the adventure of invention with the contemporary audience. We are reminded that not all paths in the past were fully explored, not all creative ventures are completed. We do not always need to look to the future for fresh and worthwhile ideas, the past is strewn with buried treasure, and experience is the true buried pleasure. “The Wooden Lightbox: a secret art of seeing” by Alex MacKenzie was shown on September 27, 2007 at Open Space as part of the Animatter Underground Film Festival in Victoria, BC, Canada. Gerald Saul for Experimental Film Review, Regina, Saskatchewan, Canada, copyright 2007.